Termite fumigations done safely and quickly. Drywood termites and termite damage can threaten the integrity of your largest investment - your home. What do you do when your pest management professional tells you that your home needs to be fumigated for drywood termites? Do not worry - you are not alone. Millions of homeowners battle termite infestations every year and many of their homes are treated by whole-structure fumigation with Vikane gas fumigant. The following answers to common questions about structural fumigation will provide peace of mind as you prepare your home for fumigation with Vikane, the most effective way to eliminate drywood termites. The fumigation process usually takes approximately two to three days. Our professional fumigator tents your home with large tarps, prepares the interior, seals the tarps, and releases a warning agent (chloropicrin) into the structure. Then, our fumigator introduces Vikane through a special hose attached to a fumigant cylinder located outside your home. Contained in the structure for a predetermined time, the fumigant penetrates deep into wood to eliminate drywood termites. After the fumigation is complete, our fumigator aerates and certifies the fumigant from your home, allowing you and your family to re-enter. Vikane is a colorless, odorless gas that is non-detectable by people during fumigation, as well as non-staining, non-corrosive and non-flammable. The gas also penetrates through most materials including paint, drywall, cabinets, and interior framing. As a gas, Vikane dissipates into the atmosphere and does not deplete the ozone. Vikane is the only fumigant registered for use in California for residential fumigation. Chloropicrin, a warning agent, is a colorless liquid with a strong odor, causing tearing of the eyes and throat irritation when used at low concentrations. Chloropicrin helps ensure a structure is vacated of people and pets prior to fumigation with Vikane. 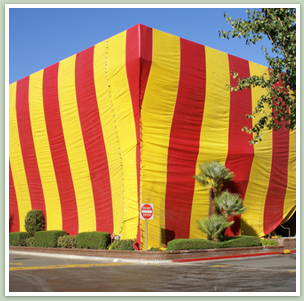 It also serves as a deterrent from early or accidental entry into a structure under fumigation. At the end of the fumigation, our fumigator aerates both chloropicrin and Vikane from the structure before allowing you to re-enter your home..
Our fumigator takes many precautions to help ensure the safety of you, your family, your pets and property before, during and after the fumigation process. Release chloropicrin, the warning agent used with Vikane, to warn anyone against entry into the structure. Secure the doors on your home with additional locking devices. Use sophisticated equipment to detect when Vikane has dissipated and the home is clear for re-entry. In addition to the work performed by our fumigator, it is your responsibility to help prepare your home for the fumigation. Taking the following steps prior to fumigation helps ensure its success, resulting in the elimination of drywood termites from your home. Check with our fumigator for additional home preparation information. Click here for a printable Building Owner's Checklist. Be sure to remove or double-bag anything that will be ingested (medicine, spices, etc.). Ask our fumigator to help you determine additional items that need to be double-bagged or removed prior to fumigation. A good rule of thumb is, "when in doubt, take it out." Here are some examples. Click on the button to download all the fumigation forms needed.